I didn’t realize that yesterday I stumbled on a relatively unknown map. Hope it comes in handy for those of you in the classroom. Brooks Simpson also posted the image on his site along with a very colorful explanation of the recent decline in Boston sports. Thank you, Brooks. One of the commenters on his site suggested that slavery in the North was insignificant. I find it to be a widely-held view, especially with my students, who are likely offered a skewed view of slavery’s origin and growth at an earlier age. My job is to correct it. I find this map to be particularly helpful. 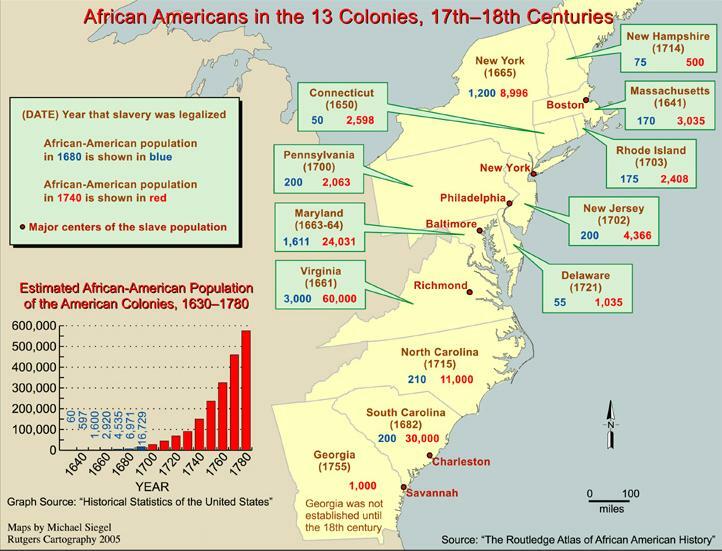 The first thing that students notice is that slavery was present in all of the thirteen original colonies. Not only was slavery present in the North, it was expanding along with the South. In 1680 New Jersey, New York, and Pennsylvania all contain a roughly equal number of slaves as North and South Carolina. Of course, slavery expands in the South for a number of reasons having to do with the decline in indentured servants and demand for tobacco and other staple crops, but what is just as important is the rate of expansion in the North. Twenty-Five years before the American Revolution there was no sign of decline in slavery in the North. Speaking loosely, slavery was clearly a national institution. There were, of course, important differences between the lives of slaves between these two regions as well as their place in society that must be noted. I usually have my students read a short selection from Edmund Morgan’s American Slavery, American Freedom, in which he distinguishes between “a society with slaves” as opposed to a “slave society.” It’s an incredibly helpful analytical distinction and one that students easily grasp. I’ve framed this year’s class around the essential question: What is American Freedom? We are just getting started exploring the origins and evolution of slavery during the colonial period, but overall I’ve been asking them to reflect, based on their understanding of the concept, just how free people were during this time. This map surely helps in that discussion. Not quite sure where we should draw “God’s Curse” and “God’s Blessing” on this map. Thanks for the maps Kevin. I am currently working through U.S. Expansion and I am teaching a unit on slavery next. These maps will go a long in providing a visual representation of the institution on a national level. I should have mentioned that the map is from this site: http://www.inmotionaame.org/home.cfm It’s an incredible resource on African migrations and includes additional maps to illustrate these movements. Related to this subject, can anyone familiar with slavery records in the North help me pursue something I recently stumbled upon? In the April 11, 1857, Columbia (PA) Spy, there’s a note that according to the 1857 Septennial Census (?) one enslaved person still resided in Lancaster County. It explained that anyone who was a slave in 1780 would continue being a slave according to Pennsylvania’s emancipation law, implying that this person was at least 77 years old in 1857. Can anyone suggest how to follow up on this reference? I feel like if I could get a couple initial details, I should be able to put together a picture of what was going on. Yes, and Ellis and Evans’ history of Lancaster County just scratches the surface. Throw together Thaddeus Stevens, the Christiana Riot, a couple vibrant African-American communities, and you get some really interesting local history. Coincidentally, it was searching for info on one of the authors (Samuel Evans) who was quartermaster of the 5th PA Reserves and wrote wartime letters for publication in the Columbia Spy that I stumbled across the note about a slave. I can’t recall if Pennsylvania was one of those states that had those post-nati laws, which Northern slaveholders abused by selling South slaves before they reached the age of emancipation. I wonder if some numerology of Native American enslavement and slave trade would add to this map. Thank you once again, Kevin, for yet another great classroom resource! Both this map and, especiallly, the AAME website will prove to be of great help to me in reaching my students!